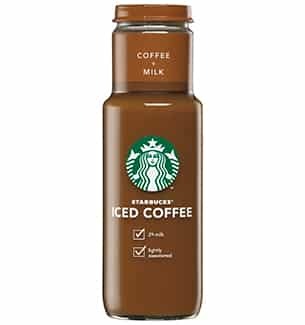 I know we’ve all seen the Starbucks bottled Frappuccinos and the canned Refreshers and Espresso drinks at stores, but did you know that Starbucks has now brought bottled iced coffees to our local grocery stores too? Maybe it’s just me, but I was totally excited when I made this discovery. The Espresso drinks and Frappuccinos were always a bit heavy to me, and I’d MUCH rather have a lighter iced coffee. So now I can stock up on bottles of the Starbucks Low Calorie Iced Coffee at home, and save myself the hassle of stopping at Starbucks in the morning! And it’s just 1 Point per bottle! So now I have a convenient and Weight Watchers friendy way of getting my java fix. The Starbucks Bottled Iced Coffees come in 3 regular flavors (coffee, vanilla and caramel) and the Low Calorie version. Please note that ONLY the low calorie one is 1 Point. The other flavors are 3 Weight Watchers Points. Big difference. But the low calorie iced coffee is delicious! Next time though, I may treat myself to a flavored one and spend the couple extra Points. I had one of these the other day when I hit the mid afternoon slump. It was wonderful..
Yep, this is a winner! so the low calorie one doesn’t come in any flavors? :( that stinks, I only like vanilla iced coffee. I don’t purchase iced coffee to often but it’s good to know there is a low cal one.